As I keep mentioning this trip to New York was a re-visit holiday rather than a brand new experience. With parents and mini Cagz in tow it was harder for me to actually go back to some of the more ‘off the grid’ places I’d been before like Strand, Greenwich Village and quiet corners of Central Park. We never ‘explored’ further than Chelsea and I barely brushed past SoHo and didn’t even set foot in Brooklyn. The bitter cold winds and packed schedule confined and exhausted us most days as we collapsed into hotel beds at 5pm to rest up for evening activities. We were seeing family most nights, going to shows we’d booked, celebrating my parent’s wedding anniversary and making sure my sister got to see ‘movie New York’ to the best of our ability. The ever-far-more-eloquent-than-I Katie of Scarphelia wrote a beautiful post on returning to New York, which perfectly encapsulates my feelings on revisiting the Big Apple too. Her feelings like my own are bittersweet. I loved being back in the hustle and bustle. The noise is louder than any city in the UK and the lights are brighter too. I loved craning my neck up towards the sky only to be met by shining skyscraper walls. I loved the quiet of the 9/11 memorial and the rush of wind on the ferry as we passed the Statue of Liberty. I loved Broadway, it’s shining marquees and lists of talented stars and incredible shows. I love the cheapness and gooey goodness of junk food on every street corner (New York pizza is forever the best I’ve tasted). But I couldn’t ignore my inner thoughts that it felt very different to be back this time. The wonder I felt slowly wandering around Chelsea Market’s endless food stalls, or spotting Midtown Comic’s windows on the Downtown loop of the tour bus, or simply looking up at the beautiful ceiling of Grand Central Station wasn’t there anymore. I knew where they were. I’d seen them before. 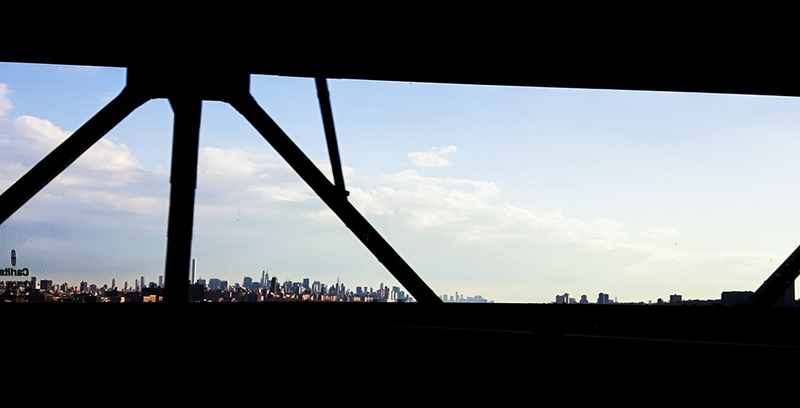 It took me a while to figure out what that feeling was and it wasn’t until we passed the view of the skyline of Downtown Manhattan on our ferry ride that it hit me. I felt safer this time – it helps I was in a group – but I was leading the way down Subway steps and up sidewalks and managed to rattle off street names off the bat. I knew where the good food places were. Knew, which museum my sister had to see if we were only going to get to one (we settled on MoMA so she could see Starry Night in person). Meeting up with relatives this time felt less awkward. I knew them already, conversations were easier, I recognised them off the bat instead of doing that squinty eye thing where you try and work out whether to go up to someone you think you know. Like I mentioned in my first post I didn’t take as many photos and I didn’t even buy that many souvenirs this time. I’d done it all before. Now before you start thinking that I didn’t appreciate or enjoy my trip over, I totally did. The feeling of familiarity isn’t a bad thing. It’s the same feeling I get walking around somewhere like London. I wasn’t as on edge to document and tick off things. If anything I was simply sitting back and experiencing this time. The city hadn’t changed too much since I’d visited last. And that honestly felt really nice. It was comforting. It felt like home. As I boarded the plane back to England I found myself once again pining for the taste of Schmakery’s cookies and the distant howls of taxi cabs and police cars. It’s the yearning homesickness I felt when I first moved out of my parents house and the feeling I get boarding the coach or train back from London or Brighton. Before I went on this trip I had people question why I was going back again so soon. Aren’t you tired of it? Haven’t you seen it all already? Well, yes, I have. But get tired of it? I dread the day I get tired of New York and honestly I hope it never arrives. Make sure you check out the rest of this NYC travel series over the next couple of days, and for more New York wanderlust check out my posts from 2014 too.